The Comus Group is proud to introduce our newest custom product from our Smart sensor line. Patio heaters have become popular with bars and restaurants since they extend the day and the season for their customers to sit outdoors. As these devices are fueled by natural gas or propane they can be a danger to the populace if the pilot light were to extinguish when such a device is accidentally tipped over allowing gas to continue to flow presenting a danger to all in the immediate surrounding areas. Until recently the only solutions were low in reliability. The PD6025 is the first ever environmentally friendly and high grade quality solution that addresses this issue. Packaged in a robust yet small enclosure the PD6025 sensor’s design marries compactness with high quality and precision. Response times of less than 1 millisecond have been reported for gas line shutoff when our sensor is installed properly. 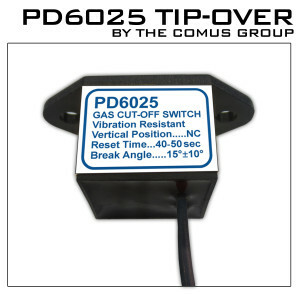 Available in a variety of mounting options and angle options the PD6025 sensor is an ideal fit for any patio heater and addresses this growing concern of cost conscious and quality safety in the marketplace.